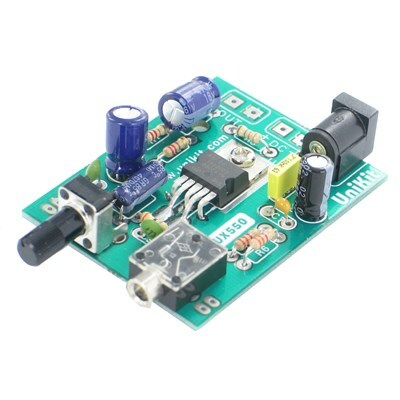 A compact mono 5W amplifier based on the TDA2003 Integrated Circuit. Its very compact dimensions and low harmonic and cross-over distortion make it ideal for all kinds of audio amplification applications, especially for kiosk or similiar application where a small amplifier is required. This amplifier provides stereo inputs and will mix both channels into a single amplified mono channel. It is ideal for use in kiosk systems or similar applications. Completely safe operation is guaranteed due to protection against short circuits, thermal over-range, load dump voltage surges and fortuitous open ground. It comes with a 3.5mm stereo audio input jack as well as screw terminals for the speaker output for easy wiring. An optional custom case with silk screened panels is also available separately under CanaKit part # BX550.